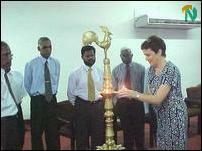 Bradman Weerakoon is also the Commissioner General for the Co-ordination of Relief, Rehabilitation and Reconciliation. The Provincial Management Development and Training Department (MDTD) organized this seminar for officials of the northeast province, sources said. North East Provincial Council (NEPC) Mr.S.Rangarajah in his keynote address stressed the future development of MIS in the northeast province. MIS should be accessible at village, divisional, provincial and national levels so it would facilitate to identify appropriate projects. "Development will be meaningless if the needs are not correctly identified. 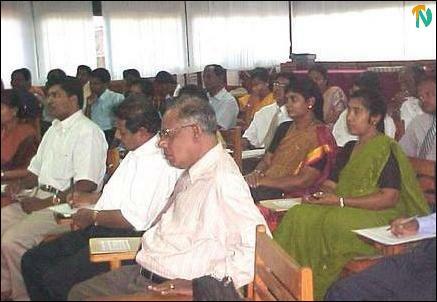 Hence MIS plays a vital role in the development of the province," Mr.Rangarajah said. The Director of the Secretariat for Immediate Humanitarian and Rehabilitation Needs (SIHRN), Mr.M.S.Ireneuss, said that data currently collected in the province have failed to reflect the real ground needs of the affected people and their province because of adopting short-term political objectives. "Information generated from village level to the national level are not very reliable and invariably manipulated to suit vested interests. The development agenda of the northeast has been totally based on ethnic politics," he said. Earlier UNDP Sri Lanka's deputy representative Ms Christine Sporel handed over vehicles and equipments to NE officials under the project "Creating Dividends of peace." 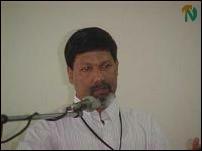 National Project Co-ordinator and Advisor Dr.V.Ambalavanar spoke on "Towards the establishment of a MIS." Dr.Ambalavanar handed over certificates to participants of the project management training workshops. Messrs M.Vamadevan, Mr.Rajendrakumar Ganesharajah, S.Ragubadda and V.Sivagnanasothy also spoke. The Rapporteur Mr. S.Krishnananthan who is the Director of the MDTD and Deputy Secretary of the NEPC made concluding remarks. "The Government of Sri Lanka initiated the national relief, rehabilitation and reconciliation (Triple 'R') framework process in July 1999. The objectives of the framework were to help strengthen the Sri Lanka's capacity to ensure that basic needs of people affected by the conflict were met, rebuild productive livelihoods, and facilitate rehabilitation across ethnic lines. "The UNDP supported project initiative 'Creating Dividends of Peace' was undertaken with the above as broad objectives. Among others, one of the major intended outputs under this project is to strength the administrative and technical capacity at division, district and provincial levels for overall management and co-ordination of relief, rehabilitation and reconciliation activities. "In order to assist in the implementation of projects and facilitation of better utilization of funds, it is necessary in the first instance, to build up an information system on project implementation. This is particularly important in respect of the North East where communication and transportation are also major problems. "The related input through training workshops for staff in project management was facilitated through the project last year. Computer systems and related equipment as well as vehicles were also made available last year through generous support organized by the UNDP. It is thus appropriate now to bring together the thoughts of the stakeholders on project implementation, monitoring and the relevant information system that should be put in place to help efficient and effective implementation. "While addressing issues related to the above, I expect the seminar to come up with some constructive ideas related to the vision for the North east of the country that has been devastated by the war during two decades. Any major task related to implementation of plans and projects should evolve around such vision. We should also bear in mind that resources are scarce and needs are plenty. Therefore, the vision for the North East as well as the management Information System that is expected to be developed should be affordable to the country while meeting the aspirations of the affected people as speedily as possible. "I wish the seminar every success and am looking forward to receiving the recommendation coming out of the deliberations."